currently I have a calcuated field column in my SharePoint list that determines if a "QC Rep" labeled a record correctly. 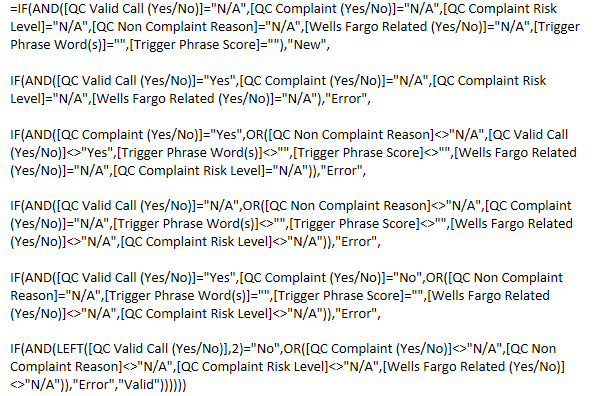 I use an IF/OR/AND statement in SharePoint that updates everytime a "QC Rep" picks a choice from different columns. My question is, in my InfoPath form-- how do I get the same functionality? Functionality meaning, when someone is using the actual FORM from SharePoint, the validation field updates real-time before the form is submitted. You can configure the validation instead of using a calculated column to validate the time when a new item or a modified item is saved to the list. It works whether you are using a OOB form or an InfoPath form. Navigate to List settings -> validation settings, specify the formula you want to use to validate data when new items are saved to this list, and type the error message to help users understand what is needed for a valid list item. To pass validation, the formula must evaluate to TRUE. the formula is similar with the calculated formula. Another method using the infoPath form, you can use validation rules for field. Not the answer you're looking for? Browse other questions tagged sharepoint-enterprise infopath or ask your own question. We have implemented a real-time dashboard in SharePoint Online - Is it possible to hide a web part until it is fully rendered by the browser?